Run-time service discovery and late-binding constitute some of the most challenging issues of service-oriented software engineering. For late-binding to be effective in the case of composite services, a QoS-aware composition mechanism is needed. This means determining the set of services that, once composed, not only will perform the required functionality, but also will best contribute to achieve the level of QoS promised in service level agreements (SLAs). However, QoS-aware composition relies on estimated QoS values and workflow execution paths previously obtained using a monitoring mechanism. At run-time, the actual QoS values may deviate from the estimations, or the execution path may not be the one foreseen. These changes could increase the risk of breaking SLAs and obtaining a poor QoS. Such a risk could be avoided by replanning the service bindings of the workflow slice still to be executed. This paper proposes an approach to trigger and perform composite service replanning during execution. An evaluation has been performed simulating execution and replanning on a set of composite service workflows. 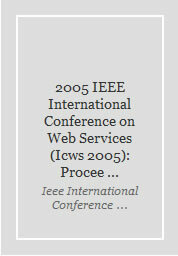 The 2005 IEEE International Conference on Web Services (ICWS 2005) is the THIRD international conference focusing on Web Services. ICWS is a forum for researchers and industry practitioners to exchange information regarding advancements in the state of the art and practice of Web Services, as well as to identify the emerging research topics and define the future of Web Services computing. ICWS 2005 is sponsored by IEEE Computer Society Technical Committee on Services Computing and will be co-located with the 2005 IEEE International Conference on Services Computing (SCC 2005). Web services are network-based application components with services-oriented architecture using standard interface description languages and uniform communication protocols. The program of ICWS 2005 will continue to feature research papers with a wide range of topics, focusing on difference aspects of IT services. Some of the topics include Web Services specifications and enhancements, Web Services discovery, Web Services security, Web Services based applications, Web Services standards and technologies, Web Services applications and solutions, Web Services realizations, semantic Web Services, and other emerging technologies or solutions.